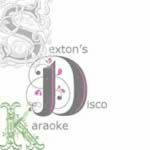 "Disco, Wedding DJ, Party DJ, Karaoke, Disco, DJ"
Sexton's Disco Karaoke offer a friendly reliable service you can trust. Whether you are celebrating a milestone in your lifemarrying your true love and future partner, celebrating 50 years of life together or holding a corporate event to celebrate a new contract. Whatever the reason we have the solution. We have music for all occasions to suit your taste. Disco or Karaokeor even soloist entertainment. We have lights and smoke machine, though not all venues will allow them. We have a very modern Bose system that throws more than enough power to keep you up on the dance floor. 50s and 60s 'we got it' 70s discos down a storm and 80s electric and 90s is like castles in the sky. Maybe that?s not for you and you prefer have a more modern interest and looking for more of a modern dance mixed with current charts. Required by many venues, Sexton&apos;s Disco Karaoke has a current PLI policy with Mobile DJ Network in the amount of £10 million. Also required by many venues, Sexton&apos;s Disco Karaoke has supplied satisfactory evidence of holding current PAT inspections of their equipment dated within the last 12 months. A Method Statement, outlining Sexton&apos;s Disco Karaoke&apos;s Health & Safety procedure for setting up disco equipment has not been supplied. Why do people choose to book Sexton&apos;s Disco Karaoke? "Jim was great - very quick responses, great communication, arrived in plenty of time a& gave the kids a great party. Would def use again! " "Sorry for the delay in responding hadn't noticed the feedback thank you for your kindness take care Jim"
"Very friendly and attentive would defo recommend and use again"
"Thank you for your kind comment it was a pleasure sorry i was not aware of the comments awaiting kind regards jim"
If you are contacting Sexton&apos;s Disco Karaoke about an event, it's always a good idea to include the DATE, LOCATION, EVENT TYPE, AGE GROUP and TIMINGS to speed things up!